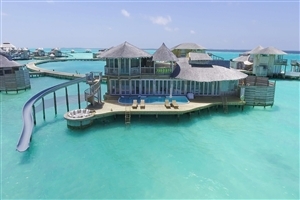 Situated in the lagoon of Medhufaru on the Noonu Atoll, the Soneva Jani treats travellers to a true 'castaway' experience with its exotic water villas all surrounded by soft sanded beaches and verdant foliage. Elegantly designed with sustainable materials and providing private pools for all to enjoy, this heavenly resort is a true Maldivian dream. Gaze out at the stars with your retractable roof, dine fine with the incredible in-house dining experiences and dive beneath the waves with the dive centre to get the most out of this tropical oasis. 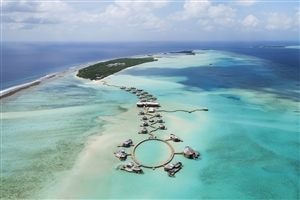 Located in the Medhufaru lagoon on the Noonu Atoll, Soneva Jani invites guests the world over to indulge their senses with elegant 'castaway' designs, tropical surroundings and attentive levels of service. 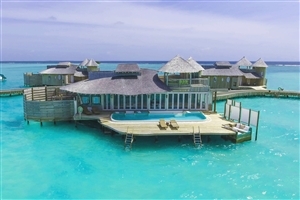 Featuring everything from a private stretch of beach to soothing spa treatments and individual pools for each of its accommodations, the resort is ideal for those looking to ease back and relax beneath the Maldivian sun. The One Bedroom Water Retreat offers guests 416sqm of accommodation space filled to the brim with plush furnishings and exotic touches spread across two floors. The villa features a private pool, a childrens' sleeping area, a living space and a roof deck. The One Bedroom Water Retreat with Slide offers guests 411sqm of accommodation space filled to the brim with plush furnishings and exotic touches spread across two floors. 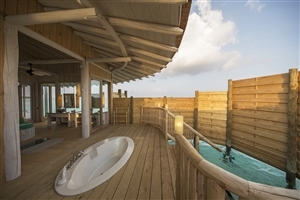 The villa features a private pool, a childrens' sleeping area, a living space, a roof deck and a water slide leading to the waters below. The Two Bedroom Water Retreat offers guests 555sqm of accommodation space designed with tropical elements spread across two floors. 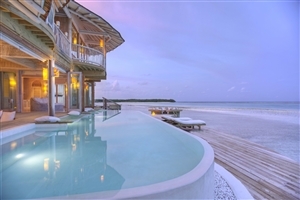 The villa features a private pool, a childrens' sleeping area, a living space and a roof deck. 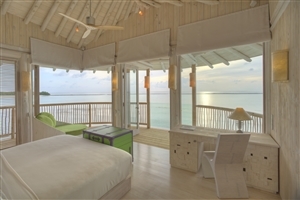 The Two Bedroom Water Retreat offers guests 555sqm of accommodation space designed with tropical elements spread across two floors. 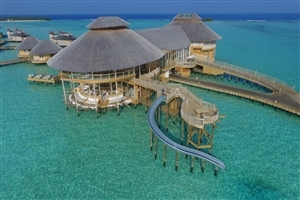 The villa features a private pool, a childrens' sleeping area, a living space, a roof deck and a water slide leading to the waters below. The Three Bedroom Water Reserve with Slide offers guests 555sqm of accommodation space that grants plenty of room to roam. 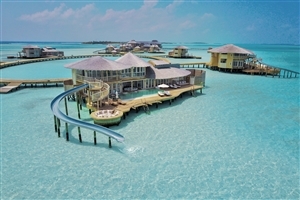 The villa features a private pool, a childrens' sleeping area, two living spaces, a roof deck and a water slide leading to the waters below. 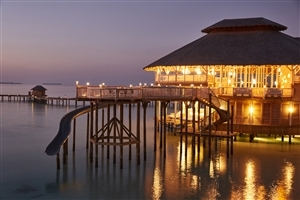 The Gathering – Choose from a variety of dining venues as this three-storey overwater structure. So Imaginative – Test your taste buds with the dishes of this experimental tasting room. 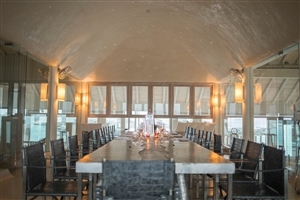 The Gathering Wine Cellar – Choose from a selection of fine wine vintages at this wine tower venue. So Fresh – Treat yourself to a feast of fruits, grilled seafood, salads and pizzas at this buffet eatery. So Engaging – Enjoy an exclusive dining experience at this intimate Chef's Table featuring a mystery menu. The Gathering Bar – Kick back and relax at this soothing all-day spot with some cocktails, coolers and tapas. So Cool – Treat yourself to a myriad of ice-cream flavours, charcuterie bites and handmade chocolates. So Starstruck – Gaze up at the stars while dining on delicious dishes at The Observatory's dining area. 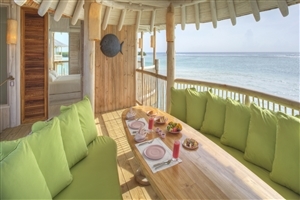 Zuhair's Beach – Sample some local Maldivian delicacies on a private North Island beach. South Beach Lunch – Savour the taste of Maldivian and Peruvian selections at this sandy beach venue. 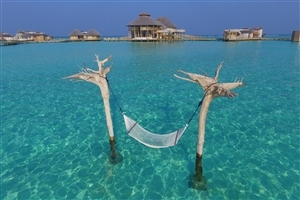 The Director's Cut by Gaston – Choose from a set menu and a la carte cuisines at this eight-table over water restaurant.